We are In Your Element Ltd, t/a ‘Elemental’ a company registered in Northern Ireland, with registered office at 1 Glen Road, Londonderry, BT48 0BX, Northern Ireland, and registered number: NI619268, (we​, us​, our​). We provide an online platform (Elemental)​ which facilitates the provision of social prescription services by enabling health and social care professionals to set up patient profiles, make instant referrals to support and link workers and onward connections to community providers, and enables the exchange of notes about patients to help assess the social prescription services being provided (our Services​). which our Client has decided to run. 2.1 In order to provide our Services, we may need to process Personal Data from time to time (that is information from which an individual can be identified). This Personal Data may be about you or other people. This notice explains how we will use the Personal Data we hold. Elemental enables users to collect and share data. This notice only deals with our use of Personal Data. Recipients (including our Client and Professional Users) are not bound by this privacy notice. (ii) If you upload Personal Data on to Elemental, it is up to you to make sure the recipient of any Personal Data you’ve sent will use the information as you intend. 2.2 We might need to change this privacy notice from time to time. If we do, we let you know. So please do keep an eye on our notice before sending us any Personal Data or uploading it on to Elemental. 2.3 All of the defined terms in this notice are explained in paragraph 14 below. If you have any questions about this notice, feel free to send us an email to dpo@elementalsoftware.co. 3. WHO DO YOU HOLD PERSONAL DATA ABOUT? (a) Administrative Users: any individuals who have been designated to use Elementalin order to manage an aspect of our Client’s Social Prescription Programme. (b) Referral Agents: any individuals who have been designated to provide social prescription referrals as part of our Client’s Social Prescription Programme. This might be a general practitioner or other health or social care professional. (c) Referral Handlers: any link or support workers who have been designated to use Elemental as part of our Client’s Social Prescription Programme. to Patients in connection with our Client’s Social Prescription Programme. 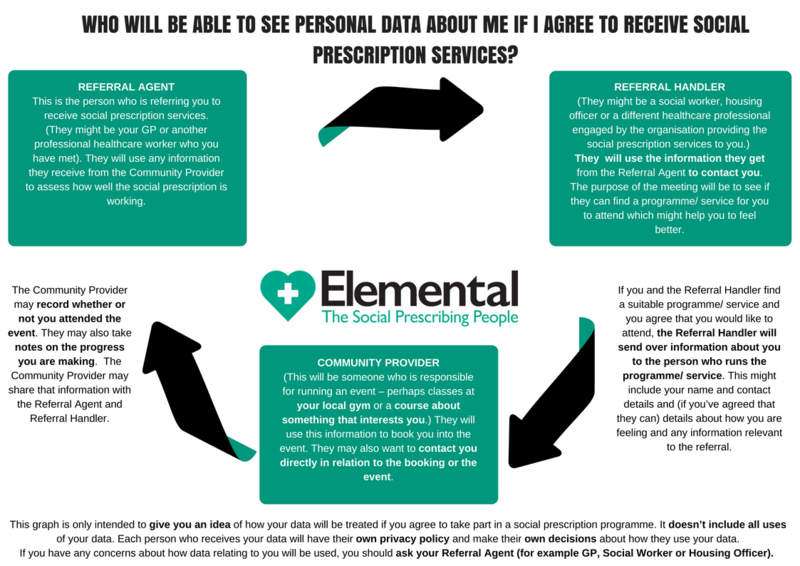 (iv) Patient Data: that is Personal Data about any individuals who have been identified to receive social prescription services as part of our Client’s Social Prescription Programme. 4. ARE YOU A CONTROLLER OR A PROCESSOR? 4.1 It depends on the data and how it is collected and used. (a) Client Contact Data . We collect and hold information about our clients for our own business purposes and we make decisions about how best to use that data. (b) Prospective Client Data . We collect and hold information about prospective clients for our own business purposes and we make decisions about how best to use that data. (c) Personal Data which we collect from a user of Elemental (User) outside the scope of our Services to our Client . ● usage Data which we might collect to ensure the integrity of Elemental. 4.3 We are a Processor in respect of any Personal Data about Professional Users or Patients which our Client Administrative Users or Referral Agents) gives us or which we collect on behalf of our Client to enable us to provide our Services. 5. WHERE DO YOU COLLECT PERSONAL DATA FROM? ● Transactional data: we may retain details about our Client’s transactions with us. We will not store or access any financial details of our Client. (i) Direct interactions with a prospective client: any information which a prospective client gives us when they contact us or us them. This might include their contact details, information about key contacts in the prospective client, information about their business and job role, their interests and needs. ● Technical Data: data about a Professional User’s IP address, a Professional User’s login data, browser type and version, time zone setting and location, browser plugin types and versions, operating system and platform and other technology on the devices a Professional User uses when they access Elemental. ● Traffic Data: that is, information about which websites or links a Professional User accesses when they’re using our services. For more information about the cookies we use, please have a look at our cookies policy, which can be accessed here. ● Technical Data: data about a Patient’s IP address, a Patient’s login data, browser type and version, time zone setting and location, browser plugin types and versions, operating system and platform and other technology on the devices a Patient uses when they access Elemental. ● Traffic Data: that is, information about which websites or links a Patient accesses when they’re using our services. For more information about the cookies we use, please have a look at our cookies policy, which can be accessed here. sexual orientation, political opinions, trade union membership, information about health and genetic and biometric data. 5.2 We may also collect, use and share Aggregated Data such as statistical or demographic data which we collect from interactions with our Clients or any Users of Elemental. Aggregated Data may be derived from Personal Data but since it cannot be used to identify an individual, it is not Personal Data. 6. HOW WILL YOU USE THE PERSONAL DATA YOU HOLD AND WHAT IS YOUR LAWFUL BASIS FOR DOING SO? (i) We hold and process Client Contact Data as a Controller, which means we must have a ‘lawful basis’ for doing so. We have set out how we use Client Contact Data along with our lawful basis in the table below. (ii) Anywhere we are relying on legitimate interest we believe that such processing is necessary for the purposes of our legitimate interest , which in this case is to function as a business. We consider such use goes no further than a Client would reasonable expect; is likely to align with the Client’s interests (by enabling us to provide a sustainable business model) and is unlikely to be detrimental to the fundamental rights and freedoms of our Client. Necessary for the performance of the contract for the provision of our services or taking steps necessary to enter into a contract. We may also need to process Personal Data about you to meet our internal administration requirements and for matters such as dispute resolution. From time to time we might contact you by telephone or email about updates to our services, new features or functions or new products we are bringing out. Our marketing may be tailored on the basis of what we think your interests are (from looking at data collected using cookies and other similar technologies as well as past transactions and interactions). We will always include the right to opt out in any such correspondence. We hold and process Prospective Client Data as a Controller, which means we must have a ‘lawful basis’ for doing so. We have set out how we use Prospective Client Data along with our lawful basis in the table below. This may involve sending you information about our services if you have asked us to do so or contacting you whether by telephone or email to discuss proposals for a Social Prescription Programme. We may carry out research online (including by looking at traffic data collected by cookies and other similar technology) and through word of mouth in order to find businesses we think might be interested in hearing about Elemental. We may use such information to make marketing calls or send an email. We are relying on legitimate interest as our legal basis for profiling and marketing. The legitimate interest being the promotion of our business. We believe that marketing of this kind is integral to getting our product known in the correct circles, and, since the marketing communication is targeted to individuals working in the field of Social Prescription, and we will only use contact details published on business websites, we believe that this will this will not be considered invasive by the Data Subject and in this case our interests and the Data Subject’s may be aligned. (i) Any Professional User Data which we have been given by our Client (Administrative Users or Referral Agents) or which we collect on behalf of our Client to enable us to provide our Services, we hold as a Processor. Provided we are acting in accordance with our Client’s instructions, we are not required to have a lawful basis for our processing. If you would like more information about who our Client is and their lawful basis, please contact us at dpo@elementalsoftware.co and we will pass your query to our Client. (ii) Any Professional User Data which we collect directly from a Professional User but which falls outside the scope of our services to our client, we hold as a Controller which means we must have a ‘lawful basis’ for doing so. We have set out how we use Professional User Data along with our lawful basis in the table below. (iii) Anywhere we are relying on legitimate interest we believe that such processing is necessary for the purposes of our legitimate interest, which is in this case is to function as a business. We consider such use will go no further than a Professional User would reasonable expect; is likely to align with the Professional User’s interests (by enabling us to provide a sustainable business model) and is unlikely to be detrimental to the fundamental rights and freedoms of a Professional User. (iv) We may also collect aggregate data about how a Professional User uses our software. This data will be anonymised and will not identify a Professional User. If you have agreed that we may do so, we may contact you by email from time to time with information about our goods and services or similar goods and services which we think may be of interest to you. We may tailor these communications on the basis of information we have collected about your usage of Elemental and traffic data we’ve collected. (i) Any Patient Data which we have been given by our Client (or Professional Users) or which we collect on behalf of our Client (including Professional Users) to enable us to provide our Services, we hold as a Processor. Given the nature of the services we facilitate, it is likely that this will include Special Categories of Personal Data. Provided we are acting in accordance with our Client’s instructions, we are not required to have a lawful basis for our processing. If you would like more information about who our Client is and their lawful basis, please contact us at dpo@elementalsoftware.co and we will pass your query to our Client. (ii) Any Patient Data which we collect directly from a Patient but which falls outside the scope of our services to our Client, we hold as a Controller which means we must have a ‘lawful basis’ for doing so. We have set out how we use Patient Data along with our lawful basis in the table below. We do not envisage that any of the Patient Data which we hold as a Controller will include Special Categories of Personal Data. (iii) Anywhere we are relying on legitimate interest we believe that such processing is necessary for the purposes of our legitimate interest, which is in this case is to function as a business. We consider such use will go no further than a Patient would reasonable expect; is likely to align with the Patient’s interests (by enabling us to provide a sustainable business model) and is unlikely to be detrimental to the fundamental rights and freedoms of a Patient. (iv) We may also collect aggregate data about a Patient’s use of Elemental and participation in the Social Prescription Programme. This data will be anonymised and will not identify any Patient. 7. WILL YOU DISCLOSE PERSONAL DATA TO ANYONE ELSE? 7.1 Disclosures of Patient Data made as part of the Social Prescription Services: The purpose of the Social Prescription Programme is to enable Professional Users to disclose and share information to each other about a patient’s progress in connection with the Social Prescription Programme. The decision to transfer Patient Data is made by the Professional Users themselves or a Patient (if they have set up their own account on Elemental). We’ve put together an infographic that might help to explain the process. If you have any questions about who your data might be transferred to if you take part in our Client’s Social Prescription Programme, please ask the Referring Agent or Referral Handler. If you don’t know who that is, feel free to send us an email at dpo@elementalsoftware.co and we will pass your query to our Client for them to contact you directly. (a) To employees and third parties (including professional advisors, such as lawyers and accountants) who are contracted to help us to provide Elemental and our business. Any such third parties and/or data processors contracted by us will be subject to strict contractual requirements only to use Personal Data in accordance with our privacy notice. If you would like more information about third party processors used by us, please contact us at dpo@elementalsoftware.co. (c) Third parties if we sell, transfer or merge parts of our business or our assets. If a change happens to our business, then the new owners will only be entitled to use Personal Data in accordance with the provisions set out in this privacy notice. 8. WHAT SECURITY PROCEDURES DO YOU HAVE IN PLACE? 8.1 It is our policy to ensure that all Personal Data held by us is handled correctly and appropriately according to the nature of the information, the risk associated with mishandling the data, including the damage that could be caused to an individual as a result of loss, corruption and/or accidental disclosure of any such data, and in accordance with any applicable legal requirements. Measures include the encryption of data while in transit via SSL, encryption of sensitive data fields at the database level including password hashing and a layers architecture with tightly controlled firewall permissions. (c) make sure that you keep any passwords associated with your Elemental account secure. 9. WHERE DO YOU STORE THE PERSONAL DATA YOU COLLECT? 9.1 For Clients based in the EU, we only use servers in the EU (and Britain). Our current host servers are provided by Amazon Web Services, whose servers are based in London. 9.2 If you are based outside the EEA and would like further information about where we hold your data, please contact us by email: dpo@elementalsoftware.co. 10. FOR HOW LONG DO YOU STORE PERSONAL DATA? (d) we may store aggregate data without limitation (on the basis that no individual can be identified from the data). 10.2 We will retain Prospective Client Contact Data for up to 1 year from the point of collection or last interaction. If a Prospective Client becomes a Client, the retention policy set out in paragraph 10.1 shall apply. 10.3 Any Professional User Data which we hold as a Processor will be held only for the duration of our contract with our Client. Upon termination of the contract, we will return or delete the Professional Data. (c) we may store aggregate data without limitation (on the basis that no individual can be identified from the data). 10.5 Any Patient Data which we hold as a Processor will be held only for the duration of our contract with our Client. Upon termination of the contract, we will return or delete the Patient Data. 11. WHAT RIGHTS DOES A DATA SUBJECT HAVE ABOUT THE PERSONAL DATA ELEMENTAL COLLECTS AND HOLDS? 11.1 Data Subjects have the following rights in respect of Personal Data relating to them which can be enforced against whoever is the Controller. (a) Right to be informed: the right to be informed about what Personal Data the Controller collects and stores about you and how it’s used. 11.2 If you want to avail of any of these rights, you should contact us immediately at dpo@elementalsoftware.co. If we are not the Controller, we will need to transfer your request to the Controller – but we will only do so with your consent. If you do contact us with a request, we will also need evidence that you are who you say you are to ensure compliance with data protection legislation. 12. WHAT HAPPENS IF I NO LONGER WANT YOU TO PROCESS PERSONAL DATA ABOUT ME? 12. 1 If we are holding Personal Data about you as a Processor, we will need to transfer your request to the Controller who has engaged us to provide our Services – that will be our Client. To the extent that we are holding Personal Data about you to facilitate our Client’s Social Prescription Programme, such a request is likely to impact on your ability to be a part of the programme. 12.2 If we are holding Personal Data about you and using that data for marketing purposes or for any other activities based on your consent, you may notify us at any time that you no longer want us to process Personal Data about you for particular purposes or for any purposes whatsoever and we will stop processing your Personal Data for that purpose. This will not affect your ability to be a part of our Client’s Social Prescription Programme. 13. WHO DO I COMPLAIN TO IF I’M NOT HAPPY WITH HOW YOU PROCESS PERSONAL DATA ABOUT ME? 13.1 If you have any questions or concerns about how we are using Personal Data about you, please contact our Data Protection Officer immediately at our registered address (see paragraph 1.1 above) or by email to dpo@elementalsoftware.co.. If we are processing Personal Data about you on behalf of our Client, we will need to pass your complaint to our Client – we will only do so with your consent. 13.2 If you wish to make a complaint about how we have handled Personal Data about you, you may lodge a complaint with the Information Commissioner’s Office by following this link: https://ico.org.uk/concerns/. 14. WHAT DO ALL OF THE DEFINED TERMS IN THIS PRIVACY NOTICE MEAN? Administrative Users: any individuals who have been designated to use Elemental in order to manage any aspect of our Client’s Social Prescription Programme. Referral Agents: any individuals who have been designated to provide social prescription referrals as part of our Client’s Social Prescription Programme. This might be a general practitioner. Referral Handler: any link or support workers who have been designated to use Elemental as part of our Client’s Social Prescription Programme. Community Provider: any individuals involved in providing programmes, activities, events or services who have been designated to provide services to Patients in connection with our Client’s Social Prescription Programme. User means a user of Elemental. ● to improve those services provided by us to you. 3.1. By using our Site, you are consenting to our use of these non-essential cookies. If you do not consent to our using non-essential cookies you may opt to block the cookies by using the appropriate setting on your browser. For more information on how to disable cookies please see: ​www.allaboutcookies.org​.